BrightHaven > Blog > Animal Hospice > It’s time to bring back the dog energy! It’s time to bring back the dog energy! Meet Rosie and Ziggy! They recently joined our Hospice/Specialized care unit! “During the last several years as we realized the sanctuary property may be in jeopardy, we made the decision that the BrightHaven sanctuary should stop accepting new lifetime residents—clearly a good one as things have turned out. However, I’d like to point out that the BrightHaven Rescue program has never stopped taking in new animals. 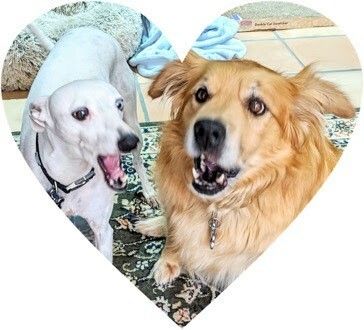 Those of you who have been reading my obituaries will realize that we have bidden farewell to most of our sanctuary population, including our last two dogs, darlings Lily and Lali. After months of no dog energy in the house (Bailey was living with foster parent Fray), my husband (and BrightHaven founder) Richard and I decided we just couldn’t stand it any longer and made the decision to adopt. We decided that in our seventies we should adopt a senior but not a hospice dog and would be chosen by someone who needed us badly. We really didn’t have to look far at all as gentle and kind Ziggy appeared almost by magic to fill our lives with love, sweetness, dignity and fun. I know you will wish to know a little more…He and his brother were left at a shelter, due to the imminent arrival of a baby in the family. Ziggy was devastated and then fell into terrible despair when very soon his brother was adopted. He had lost all that he knew—his family and then his brother. He is a special, kind and forgiving dog who has opened his heart fully to us. …..and so here he is—9 years old we’re told and not at all the kind of dog we expected, BUT it seems that he was sent to us by Lily. 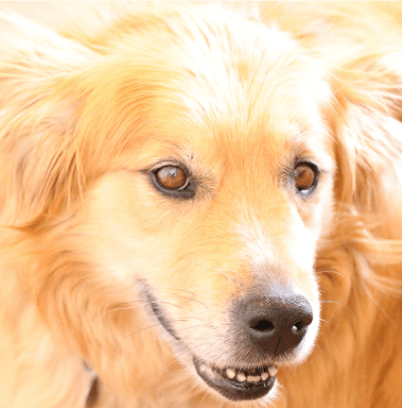 Lily was the sweetest dog on the planet and with all sorts of special quirks…. like her hatred of rain or getting her feet wet, her love of choosing her own special walks. We always called her “Big dogs” as she was really a BIG dog housed in a little dog’s body. Sensitive and soulful Ziggy on the other hand, is a little dog housed in a big dog’s body who hates water, runs from the sprinklers, just cannot even bear to get his feet wet and knows every inch of and enjoys his special Lily-chosen walks. Most of all he loves to try to curl his big dog body into a lap only large enough for a small dog!! Ziggy does have a little disorder of his digestive system, but is too embarrassed to mention it…. And then came Rosie (formerly Sweetie). One only has to look at this happy, smiling and laughing face to know this beautiful spirit. We were asked to help Rosie because she has endured a very difficult life before being given up with her aggressive brother…We know that the pair lived on a concrete patio with a wooden palette for a bed, guarded the property with their big barks, did not go for walks but was praised for chasing cats away….and Rosie was allowed to eat herself into becoming morbidly obese, arthritic, almost unable to walk and with a serious heart problem. 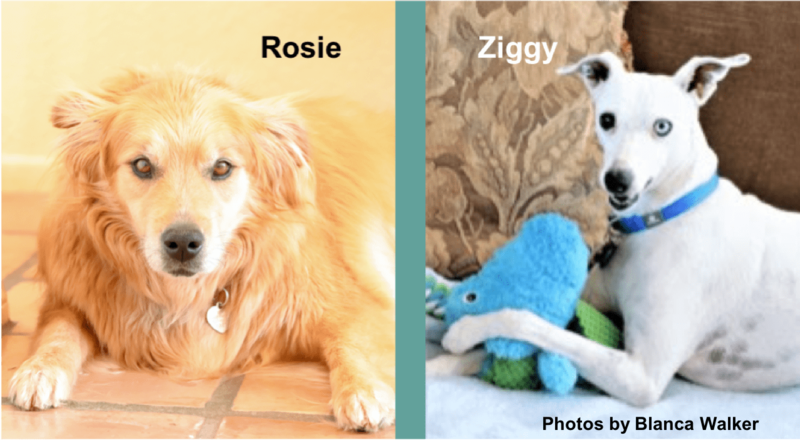 I have to tell you what happened when we took Ziggy along and went to meet Rosie…. Rosie came huffing, puffing and waddling to meet us. We stretched out our hands to say hello and she merely pushed on past us, completely focused on Ziggy, who she almost devoured in kisses. 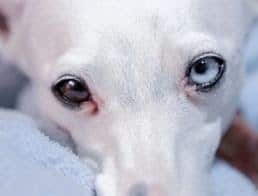 She licked him effusively all over and around his face and, after a moment or two of surprise Ziggy reciprocated and returned the affection. A match made in heaven huh! Nine-year-old Rosie has lived with us now for several weeks and has lost 10lbs in weight so far. Her red fur gleams in the sunshine and she valiantly tries to keep up with bro Ziggy on their walks. Happily, she really is able to walk and not waddle now and is covering about two miles a day. Needless to say, we are all getting slimmer and fitter right now! I guess you could say the twosome are just what the doctor ordered—for us!